Though this has happened before, but it is my first time seeing this. Don't laugh! But it is indeed very pretty. The Moon Halo happens when there are Ice Crystals, also known as diamond dusts floating around the air. To know more, kindly visit Wikipedia. The story of my experience with this moon halo started out rather plain. I was driving home, when my boyfriend texted me. He asked me to look at the sky once i get home, because there's a halo. So every time when i'm stopped by the red light, i'll look at the sky and see what halo he's talking about. I think i did this for like 3 times? But saw nothing. When i got home, I called him and asked him what he was talking about. 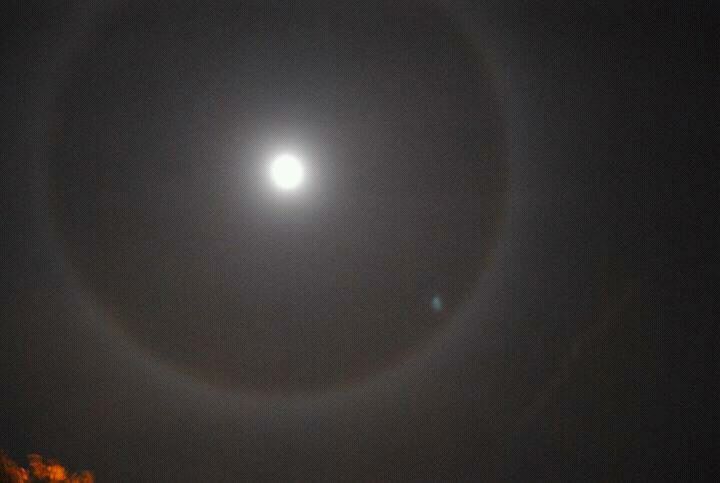 (Again i've never seen the moon halo before) Then i looked up and i finally saw it! My first impression or thought was that it looked scary to me. Scary because i thought it was another sign of the world is ending soon. I know I'm nuts for thinking of that out of all things. When i got home, my cousin sent me a picture of the moon halo, and i did a tiny research about it. Well it is basically what Wikipedia said, so click on the "Wikipedia" link above.